My mother always says that she is not a particularly good cook, though I beg to differ. But she proudly admits to having the skill to brew a perfect cup of tea. The tea that she makes with shincha - green tea made only from new, young tea leaves - has a delicately sweet flavor that seems to blossom in one's mouth, with no bitterness at all. Since she is here now for a month long visit from Japan, I thought that I'd finally pry out her secret to making such delicious green tea. And so...here it is. Make sure that you have good shincha, which has a true delicate sweetness. Use an earthenware or ceramic pot. Make only one or two cups worth at a time if you can. Pour some of the hot water into the waiting teapot to warm it up. Warm up the tea cups at the same time, then throw away the water. Use 1 1/2 teaspoons of tea leaves per 2 cups, and put in the warmed up pot. Put in enough hot water (2 cups worth), then let steep for about 3 minutes, no more. Use a tea strainer to gently pour out the tea. You might be skeptical, thinking "you need boiling water for a good cup of tea!". That's what I thought too, until I tried this method. It really does produce a most superior green tea. Boiling water seems to work better in bringing out the oils in more robust teas though. Note: Gyokuro is a type of tea that is most often sold as shincha and is widely available. Submitted by maki on 2006-05-24 19:25. Is Sencha a totally different kind of tea or just an alternate spelling of Shincha? Gerald, Shincha means 'new tea'. Sencha is a term for a kind of green tea - it can just mean generic green tea, though made from tea leaves only. (Kukicha is a tea made from the stems of the tea only.) So, some sencha can be shincha. Shincha (new tea) is special because it's made only from tender young green leaves that come out in the spring; the young green leaves must be harvested by hand, so shincha can be rather expensive. Gyokuro is also a kind of tea that can be shincha or not, but most gyokuro (which is expensive anyway) seems to also be shincha. I hope that wasn't too confusing! Yep, when making green tea the water should always be around 80-90 degrees - boiling water makes green tea bitter. I used to hate green tea until someone told me that, nowadays it's my favourite. I'd always heard of sencha used to refer generally to highest grade of green tea, newest leaves, etc. Never heard the term shincha. One of my favorite memories of all times was the macha I had on the veranda of the Kyoto temple where the tea ceremony was invented. Such a rare, peaceful moment in the buzz of the cities. Just perfect. Our tea grower here in Saitama recommends 80 degrees centigrade water. We buy Sayama shincha direct from their little shop surrounded by their tea fields ten minutes walk from where we live. The newest tea is plucked by hand by gangs of older ladies bundled up in big hats to protect them from the sun. Later crops are harvested either by a sort of hedge trimmer with a bag attached, or at the larger fields, by a vehicle that rolls above and astride the tea hedges, clips the leaves, and vacuums them into a container. There was a lot of rain this past season, so the tea is slightly suboptimal this year. yeah, green tea should always be made with water that's a couple minutes off the boil, same with white tea. otherwise they'll end up really bitter! I too love green tea, it takes me back to August and sitting on the tea house on the Hamarikyu garden @ Tokyo. I tend to brew sencha one cup at a time too. Actually the pot in the photo is a one (large) cup capacity teapot, or two small teacups. It is a bit of a bother to clean out the leaves every time, but does make a nice cup. I also used to have a two-cup teapot with a built in tea strainer inside, which was handier for straining out the leaves and cleaning, but I broke it... Anyway a small teapot may be the best way to go for loose tea leaves. How do you brew your one cups of sencha? Regular tea-bags? Pricca I usually use a spoonful (a small teaspoonful...the spoon came with some tea I got a long time ago) in the pot. I do use teabags sometimes though! I just wanted to make a quick comment regarding spoon. I bought this awsome sencha from selectgreentea.com. They gave me a spoon for sencha that I purchased. 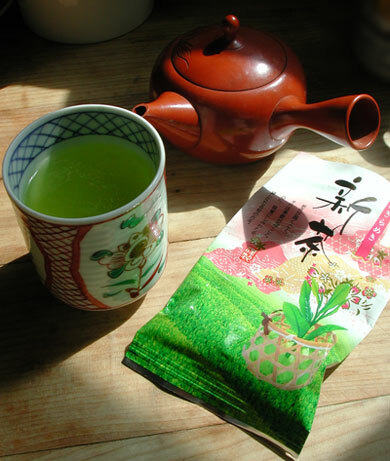 Just one scoop for each cup or two and made a wonderful cup of sencha everytime, without any fuss. Anyway I fianally feel like "This is it!" about making cup of gooood green tea. Thanks to selectgreentea.com! You should check it out! First of all I just love your blog -- thank you for taking the time to share SO MUCH information! But I need help. I'm giving a Fundraising Tea (for sea turtles) and the theme is Green Tea Tasting. I need advice on different green teas that might be interesting and is it possible to make large quantities without ruining their essence or is it best to just brew small amounts at a time at each station? (Pretty challenging) I'm hoping 50 people will come. Any suggestions of sweets or savories that would go well (not too complicated since I'll hopefully be serving many). I will print out this blog and start practicing all the advice. The tea is in May. I'll have to think about that a bit.. I'll have to think about that a bit Nanette... I'll post back here as soon as I have some good ideas! Nanette I've posted my answer here. Hope they will give you some good ideas! In America, there has been a recent trend in the advertisement of "White Tea" which are supposedly freshly picked buds. Is this the same as Shincha, or is white tea a Chinese tea? Is white tea roasted? I do not recommend buying tea bags of white tea...or bags of green tea if you're curious. Can you use any type of new tea leaves for shincha, or are there a specific type of leaves that you need to use? Also, what is that package next to the tea in the photo? Can that be purchased at a Japanese store in America, or is that only available in Japan? I've just discovered your brilliant blog! I've recently got into Japanese food via Harumi Kurihara's UK books. Miso soup is my standard breakfast now. Anyway, one thing that has eluded me thus far is tea that is really green coloured. In my Harumi book there is a photo of a cup of bright green tea: not brown or pale yellowy-green, but bright green. I use water that is not boiled. Do you know what type of tea is this colour? I wonder if it was shincha? Anyway yes. 80-90 is the perfect temperature for green tea. For Shincha I would have said 80 because of its delicate flavour, but then again everyone has their own preferences to tea! I have seen some discussion on white tea here, white tea should be brewed at around 70 degrees as it is very delicate and not as a robust as a green or black tea leaf. White tea is to do with the picking and process used to dry the leaves etc. Wiki here has a bit of detail http://en.wikipedia.org/wiki/White_tea and as it says it is normally the buds and extremely young leaves that are used. Shincha uses young leaves and then goes through the green tea process. If you liek green tea I do reccomend you trying white tea and even a good oolong.